When you live somewhere with slow and unreliable Internet access, it usually seems like there’s nothing to do but complain. And that’s exactly what residents of Orcas Island, one of the San Juan Islands in Washington state, were doing in late 2013. Faced with CenturyLink service that was slow and outage-prone, residents gathered at a community potluck and lamented their current connectivity. Doe Bay is a rural environment. It’s a place where people judge others by “what you can do,” according to Brems. The area’s residents, many farmers or ranchers, are largely accustomed to doing things for themselves. Sutton’s idea struck a chord. “A bunch of us finally just got fed up with waiting for CenturyLink or anybody else to come to our rescue,” Sutton told Ars.Around that time, CenturyLink service went out for 10 days, a problem caused by a severed underwater fiber cable. Outages lasting a day or two were also common, Sutton said.Faced with a local ISP that couldn’t provide modern broadband, Orcas Island residents designed their own network and built it themselves. The nonprofit Doe Bay Internet Users Association (DBIUA), founded by Sutton, Brems, and a few friends, now provide Internet service to a portion of the island. 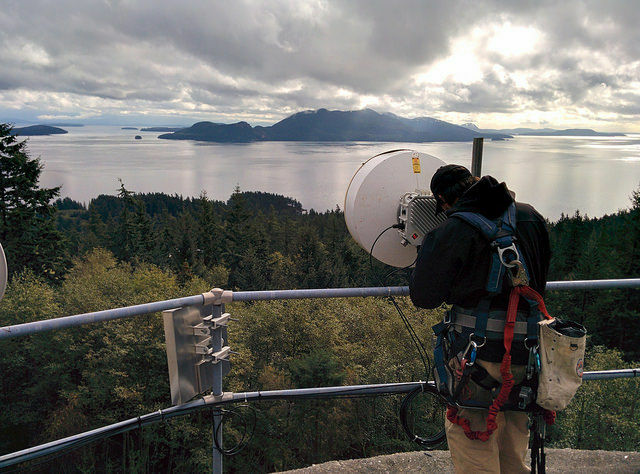 It’s a wireless network with radios installed on trees and houses in the Doe Bay portion of Orcas Island. Those radios get signals from radios on top of a water tower, which in turn receive a signal from a microwave tower across the water in Mount Vernon, Washington.